Valentine's Day is right around the corner and while I don't usually decorate big for the holiday, it's hard for me to pass up an opportunity to add a little (more) red to my surroundings! Last year, I made a very pretty garland out of old puzzle pieces, to decorate my kitchen hood. I loved the idea so much that this year, I decided I would once again hang something in the kitchen...but what? You see, I like to change things up year to year, but I also like super easy, super inexpensive projects that look elegant and add something special to my home. So I put my crafty thinking cap on and went to the store. Once there, I found these neat note cards in the "2 for $3.00" bin. I fell in love with the colors and farmhouse feel right away. I knew they would look great in my kitchen and with the addition of a few hearts, they would make a stellar Valentine banner. I could've bought hearts, but for .49, I bought a piece of dotted scrapbook paper instead. I like a bargain and it's a heavier weight, so it's on par with the note cards and hangs properly. Once at home, I grabbed a red ribbon from my stash and tacked it to the hood. I simply arranged the cards on the ribbon to fit the space and added the teeniest drop of hot glue to keep them locked in place. 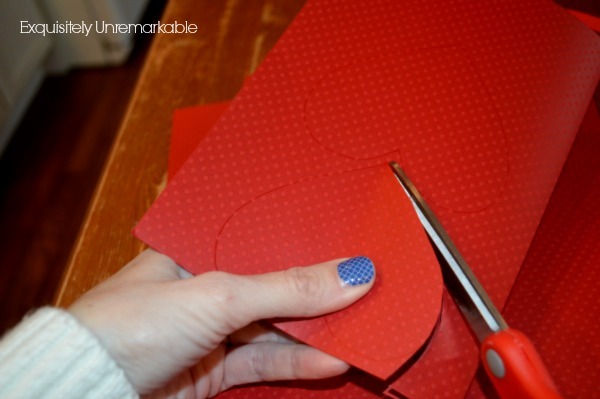 Next, I made a heart template, using an index card, and cut out 4 red ones from my dotted paper. Of course, in typical Kim fashion, I dropped one on the counter....and it landed in a puddle of water. Murphy's Law. It was ok, I just grabbed the hairdryer and I was back in business. Now, I really like the banner without the hearts. I feel like it's something I could keep up all the time, either on the hood or on my fireplace mantle. It is sweet and simple on its own and without the hearts, completely season-less. So, I used the super teeny, tiniest amount of hot glue I could to adhere the hearts to the ribbon, so that when Valentine's Day is done, I can remove the hearts (if desired) and still be left with a fabulous decor piece. By the way, the same goes for the note cards. I can just rub the glue off if I ever get the desire to use them to write out an actual love letter! In the meantime, I am very pleased with my new Valentine note card banner. It's very festive and adds just the right touch to my holiday house. Of course, my daughter thinks it reads, "Hello, I love chickens! "...which I do, so that's ok! What are you loving this Valentine season? Great minds think alike. I have been looking at bunting ideas today too. My daughter has a friend with breast cancer and their group of girlfriends have formed a team and are raising money to do the 3 day walk. They are having a fundraiser so I have been looking at ideas for a bunting and some other projects for the fundraiser. Of course it will be pinks. 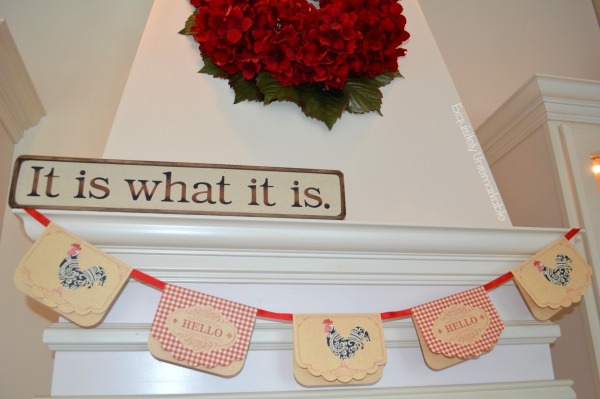 Yours turned out so cute and the roosters and red tie in with your other roosters and red. I hadn't considered gluing to the ribbon. I was thinking of threading mine on ribbon but adding some glue might make it much more sturdy. I think ours will hang on a table and so it might get brushed up against. I used fun card stock with hearts and dots. I used pink, red and white lace hearts too. I love the look of your banner. How sweet and looks great in the kitchen. Charming Delightful Cheerful Lovely Banner . . . It's so cheerful and pretty! I think it's banner season, Lorri! Maybe we're all looking to fill the space left open after holiday decorations come down. Your bunting sounds a bit more serious...and for a really good cause. Hot glue is my best friend. I hope it works for you and sending prayers for your daughter's friend. I can tell!! ;) Thanks so much, Lynne!! That puzzle piece Love decor was ingenious! Good morning Kim! You have certainly inspired me to paint my kitchen white this summer. We share the same stove hood! Great ideas; I can't believe that February is just around the corner! YIKES! Marcy, you just brought back such nice memories. It sounds like you make the day very special for a lot of people around you. We never really decorated for Valentine's Day in my house, growing up, but I always remember my dad would bring us small heart shaped boxes filled with those mystery chocolates! You never knew what you were going to get until you bite into it! I loved those red boxes, I used to keep them and fill them with treasures! :) Thanks for the comment and have a great day! Your bunting is absolutely adorable! You come up with the cutest easy ideas. The note cards are perfect. I always love the look of buntings but can't figure out where to put them. Must work on that. Stacey, my easy ideas are a product of my laziness when it comes to decorating! I adore the finished products, but I am not much of a process girl! I bet this would super on your fireplace mantle or even on the piece in your entryway! 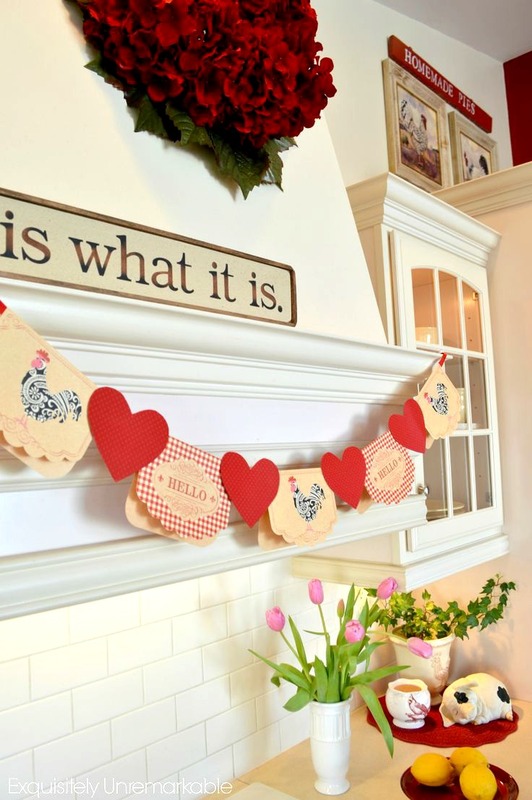 Chickens are such loveable creatures and a favourite motif in the farmhouse/rustic/cottage realms of decor, and so it is most fitting that they are part of a valentine banner, and a very pretty one at that! I love the banner...you have coerced me into thinking that I might have to get busy and make one!!! I will have to check out Michaels to see what they have in their bins! 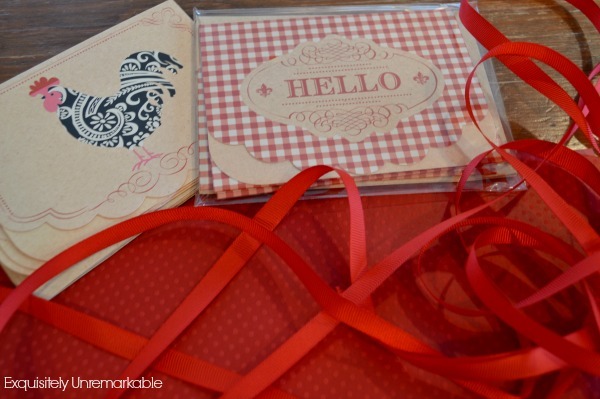 I am also in love with your red placemats....of course....they are RED!! Thanks Nancy!! My tutorials are so much prettier now, aren't they? ;) Hope you're warm in your neck of the woods!! Thank you, Diana!! It's so great to see a comment from you!! :) I am glad you are feeling better! You might find these exact cards, Jaybird, because that's where I found them! I even had a 20% off coupon! I bet they would look great in your home...and those placemats? I bought them at Marshall's years ago and they are my all-time favorites. They are starting to show their age, but I just can't let them go and I haven't been able to find anything to rival their pop!! :) Thanks for the comment! The banner is delightful. Debbie is away but I showed it to her in a message. We both love it! 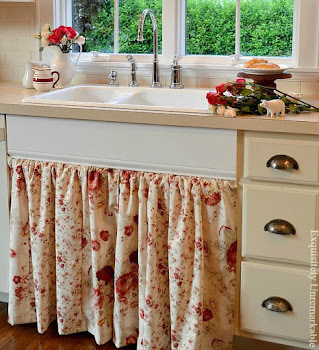 I've pinned it to the Better Homes & Garden board, we are so glad you shared it with us! I love your banner! The cards have a vintage feel to it that I adore! Love the touches of red throughout your home, Kim! Your banner turned out so cute. Love your hydrangea wreath too. I couldn't stop staring at your glass cabinets in your kitchen. I always wished we had the same. It would be so neat to display some of my favorite pieces with the lights shining on them. I love your banner, Kim...both with the hearts & without! It looks fantastic on your kitchen hood! Thanks Gina! I may keep this one up for a good long while! :) Thanks for popping over, that was kind of you to visit! The banner is very pretty - and I like the idea of making something that can be enjoyed beyond Valentine's Day. Your range hood is beautiful. I've shown it to my husband and asked 'can you do something like this?' I think it would suit our new-old house. Thanks for the inspiration again! Thank you so much ~ I'm so glad you've found some inspiration! My hubby built that hood. It really wasn't that difficult (says the wife did not help at all! ;) ), he built a frame, covered it with sheetrock and we had our contractor add some fancy moulding! I have to say, I still adore it, over a decade later! Keep me posted! I loved your Banner and the wreath on the hood. I just recently moved into a house with a metal hood, and am wondering how you attached the hood. Thanks Sally!! :) It was so easy! 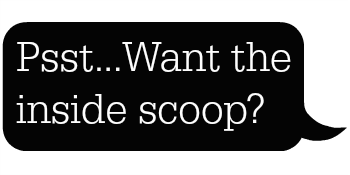 You could whip one up in a jiffy! Sally, you're so crafty, I bet you could make some! This is so cute. I love making banners. Thank you for linking up to Party Time and we hope to see you again next week! Kim, I think the banner is just darling and I love your cheery kitchen! That is so cute, Kim, and looks just perfect across the range hood. The cards are so noteworthy, but I'd have tough time giving them away.......selfish me! Glad you like it, Andie! :) Thanks for the visit! I love garland, in any form!!!! Your banner is so pretty! Thanks for the inspiration! It is banner season, isn't it! Yours is elegant and so pretty. I love the roosters and it's so cute that your daughter thinks it says you love roosters! I would love for you to come and share this with our readers at the Spring Crafts Blog Hop! Stopping by from Retro Repin. 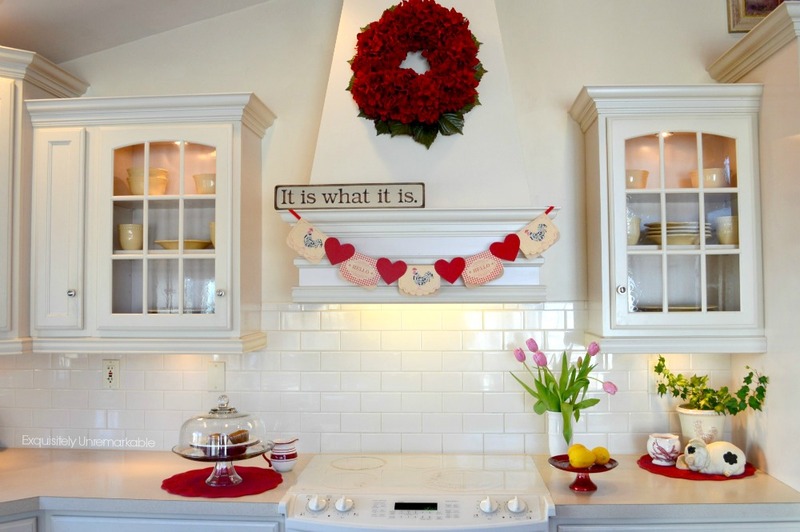 This is such a fun and easy Valentine's Day decoration! I LOVE the puzzle piece garland from last year too! Such a unique idea!! Thanks for sharing your creativity at A Little Bit of Everything link up! 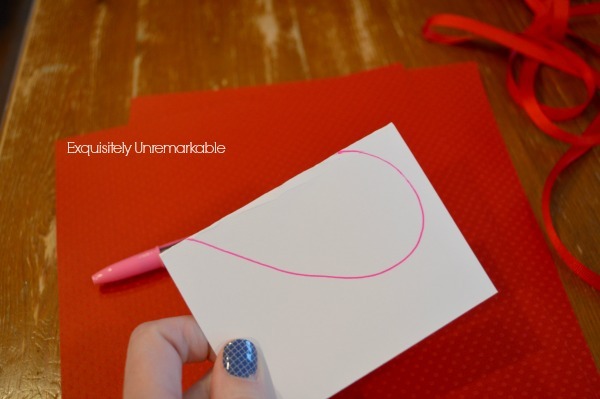 Love your Valentine's banner :) and the name of your blog - so awesome! Such a great idea and adds a little cheer for Valentine's Day! Also love your "It is what it is" sign...definitely one of our favorite sayings :) Thanks for sharing on Something to Talk About...hope to see you back next week! "Hello, I love chickens" lol!! Priceless. Lovely Valentine's banner, and then for year-round :) ♥ Found you at Elizabeth & Co.
Hi Joy! Thanks so much for popping by! Kids are funny, aren't they? I'm glad you liked the banner! :) Happy Valentine's week! A little behind the time, but i am new to your amazing talent. Off the "Valentine's Day" topic, we are getting ready to install an over head cooktop exhaust hood, removing down draft cooktop. Did you DIY the hood shown in these pics or purchase/have made? This is style we would like, any help/information appreciated. p.s. Great Vday decor, too! Hello! So glad you stumbled over my site, what a lovely comment! Thank you. ☺️ We did DIY the hood. We purchased the vent/ light kit at the supply house. My husband installed it per instructions and vented it out through the roof. Then he framed out the hood shape with plywood and sheetrocked over the framing. The bottom portion was trimmed with moulding pieces we bought from Kraftmaid to match the cabinets we own. If I'm not mistaken, the flat pieces on the bottom, in between the moulding, were made from leftover kick plate trim...also from the cabinet company. I hope that helps! 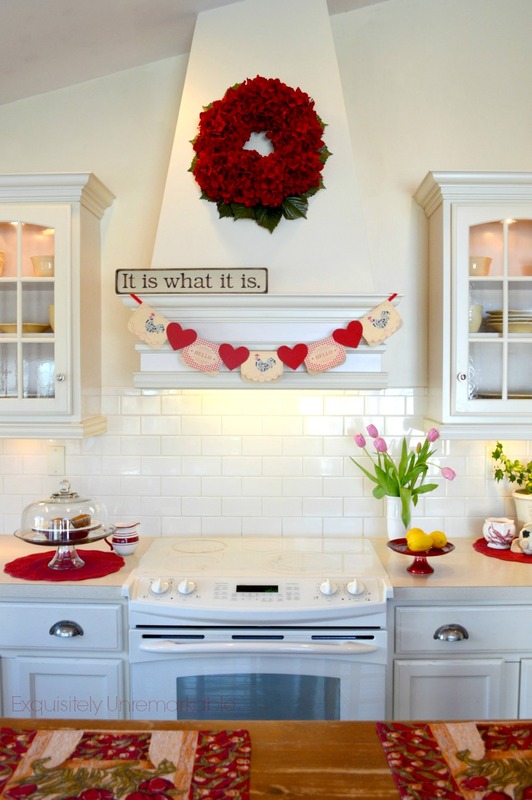 Sounds like you're going to have a fabulous focal point in your kitchen. I adore my hood. Good luck and thanks again for the visit!